It seems an odd place to nest. A concrete bridge spanning the Santa Rosa Sound, connecting the mainland of Navarre, FL with the barrier island. Its sides slope to the water, sandy with tufts of grass and vines growing where they can. Normally these sides are empty, but in the summer months they are alive and noisy with nesting Least Terns and Black Skimmers. The seabirds are colony nesters, and depend upon large numbers to protect their chicks from predators. 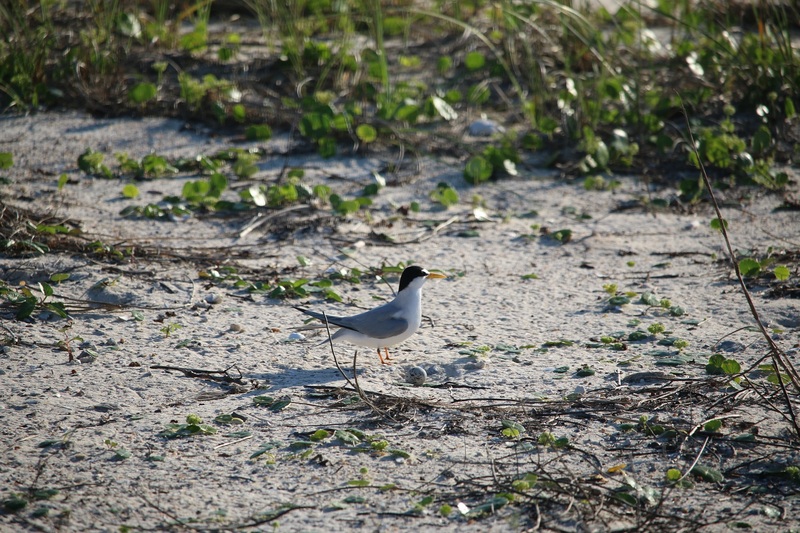 They are also adorable: Least Terns are less than ten inches long, with high-pitched calls and bright yellow bills. 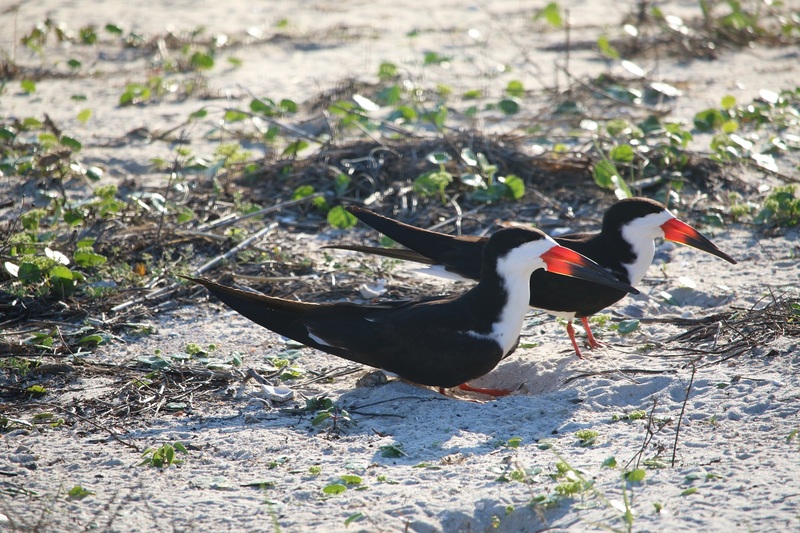 Black Skimmers are much larger, with black and white bodies contrasting against orange and black bills. Last week I saw the very first eggs of the season, tucked into small depressions in the sand. During the summer of 2015, this was one of the most successful colonies on the Florida Panhandle, fledging dozens of adorable, fuzzy chicks. Since I moved to this area last summer in July I have seen the chicks, but never the eggs! Due to its importance for the populations of these two species – both of which are at risk – the nesting area is roped off from the main road to prevent pedestrians and anglers from trodding through the nests. Later in the season, mesh will be added to prohibit the tiny chicks from running into the road. Terns and skimmers traditionally nest on beaches and dunes, but coastal development and the rise of predators like feral cats and raccoon have taken a toll. While I earnestly hope that beach protection efforts will aid the seabirds in their natural nesting environments, I am relieved that these resilient species are able to successfully nest in other areas, even if it is on the side of a busy road! Interesting and those birds with bright colours are beautiful. I’ve never seen black skimmers before, even in photos. Beautiful.